The big news at Oregon Business is we’re getting a ping pong table. After reading the descriptions of the 2015 100 Best Companies to Work For in Oregon, a disproportionate number of which feature table tennis in the office, I decided it was time to bring our own workplace into the 21st century. It was a tough call, but it’s lonely at the top, and someone has to make the hard decisions. Now, it’s easy to poke fun at office ping pong as a low-cost way for management to keep the workers happy: opium for the masses, as it were. But as research editor Kim Moore reports in her story about this year’s 100 Best, table tennis is only the tip of the iceberg. I’m not talking about the kegerators, the Nerf guns or the free-trade coffee in the kitchen. I’m referring to a larger shift underway that downplays hierarchy and silos in favor of a decentralized and collaborative workplace. The result is an empowered and entrepreneurial labor force that is taking ownership of company practices. Today’s workers may be playing a lot of ping pong, but they are also designing their own work schedules, driving new customer service initiatives and helping forge stronger relationships between employers and the communities in which they are located. 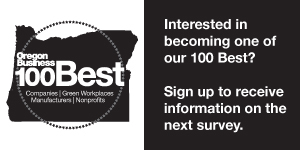 This is the 22nd anniversary of the 100 Best Companies to Work For in Oregon project. One of the advantages of such a long-running project is it gives us perspective not only on how workplace trends have changed over time, but also how they intersect with broader social, economic and cultural changes. The world is flattening, and so is the workplace. It’s a fascinating story that begins on page 40. Congratulations again to the 2015 class of 100 Best Companies. And if you didn’t participate this year, we encourage you to sign up for the 2016 100 Best project. That survey opens next August. In the meantime, I’ll challenge anybody to a game of office pong. I was pretty good back in the day.